A spokesperson for the New York state court system confirmed to E! 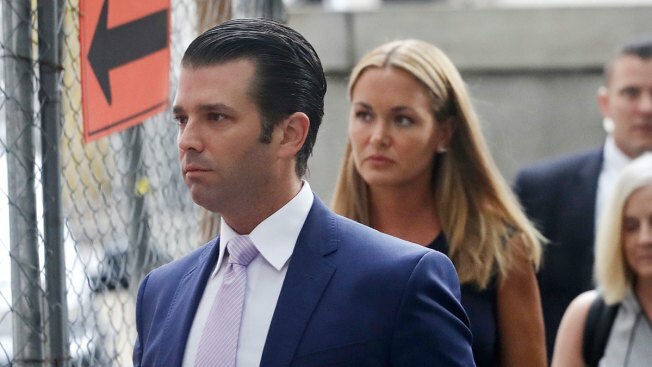 News that the divorce case "has been resolved"
In this July 26, 2018, file photo, Donald Trump Jr. and his wife Vanessa arrive for a divorce hearing in New York. Donald Trump Jr. and Vanessa Trump are officially over. The former couple confirmed Friday morning that they settled their divorce just before starting 2019. "We finalized our agreement at the end of last year," the pair said in a joint statement to Page Six. "We are incredibly lucky to have five amazing children and are committed to raising them together. Our kids and their happiness will always be our first priority." A spokesperson for the New York state court system also confirmed to E! News that the divorce case "has been resolved." The duo announced their split in a joint statement in March 2018. At the time, both parties made it clear that they wanted to put their children first. "After 12 years of marriage, we have decided to go our separate ways," their statement read. "We will always have tremendous respect for each other and our families. We have five beautiful children together and they remain our top priority. We ask for your privacy during this time." In May 2018, President Donald Trump's eldest son made news for reportedly dating Fox News host Kimberly Guilfoyle. They would end up celebrating Christmas together. "We're looking forward to quality family time--playing with them, everyone getting to relax--especially coming after midterm elections so much," Kimberly told E! News at the DailyMailTV holiday party. "It's been a very political season, and so this is nice to reflect on what matters, what's important--and that's family time [and] spending it together." Most recently, Donald and Kimberly celebrated Valentine's Day together with a romantic dinner at Nello in New York City. "Great Valentines Day dinner with @kimberlyguilfoyle out on the town in NYC," he shared on Instagram. "#valentines #valentine."